I feel like I’m getting back into the swing of cooking for my family. I’ve been working on a couple assignments the last few weeks that had me creating and cooking fun food, but not our usual fare. This last project was a week and a half of kid food. About halfway through Jesse informed me if I was going to keep doing this type of work he could only eat so much macaroni & cheese and chicken fingers. They were good, but I agree with him. It’s nice to have some adult food again! My husband loves gnocchi and tomatoes so I tossed them into a mildly garlic cream sauce as a sorry I fed you toddler food for the last 9 days will you forgive me meal. If I keep this up maybe he’ll forget he tested three pans of chicken fingers, two batches of macaroni & cheese, three tries with another pasta dish, four versions of carrots, endless amounts of corn and many other kid friendly meals. On the other hand, my daughter loved it. She’d prefer I cook that way all the time and hopes I’ll get another assignment! I do too honestly. It was exciting to step out of my comfort zone and create something new. This dish is quick to throw together on busy evenings. You’ll only need about 35 minutes tops from start to table. Place the tomatoes in the baking sheet and toss with a little garlic olive oil, salt and pepper. Bake for 20 to 25 minutes until skins pop and tomatoes are soft. Cut in half if you like smaller tomato bites. Meanwhile, in a bowl toss the Parmesan with flour. Set aside. Bring a pot of salted water it a boil for gnocchi. In a large saucepan melt the butter and olive oil together over medium heat. Add the garlic and sauté for about 30 seconds until fragrant. Turn the heat to medium low and add 1/4 teaspoon salt, 1/4 teaspoon pepper, half and half, and lastly cheese. Stir constantly until sauce simmers and begins to thicken. Do not boil. Cook gnocchi according to package directions. Reserve ¼ cup pasta water at the end of cooking time. 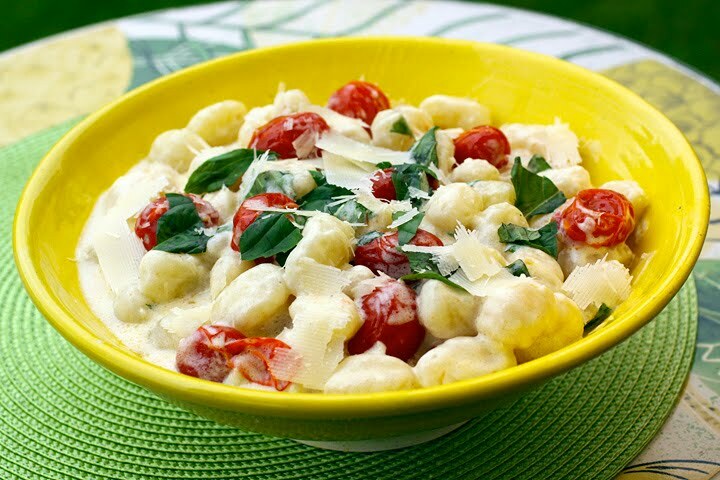 Drain gnocchi, toss with sauce, roasted tomatoes and basil. Add some of the reserved pasta water if needed. Garnish with more Parmesan if desired. Notes: For two people cut the recipe in half. What a delightful summer pasta. I have been wanting to try gnocchi before, but I haven't had a good recipe. Now I'm all set! If you ever need another mac and cheese taste tester and you want to send some to NY...I'll be willing to take one for the team. In the meantime, this gnocchi looks fabulous! Love the garlic cream sauce! Laura, this seems very easy to make. I am up to it on of these days. That looks great. I like how you used gnocchi for this. Yum! You photograph it so well, it makes me want to it right now for breakfast! I forgot to add that I didn't find the eggplant...unfortunately they were out! But they do carry it, so I'm going to give it a try soon! These gnochhi look lovely!! What a great dish! This looks good. I too have been busy. So glad school is out woo hoo!! I'm back and ready to start cooking! I had grand plans to make my own gnocchi but this is more my speed. With Gabrielle being so small still she wouldn't have the patience to sit through the process of me making gnocchi. I love this combo of flavors! Anything with gnocchi is good, put cream sauce on it and I'm over the moon. Sounds like a cool assignment you were working on. This cream sauce looks amazing! Love love love gnocchi! wow che invitante questo piatto!!complimenti!!! You had me at "35 minutes tops". :) I've been looking for new and interesting ways to prepare gnocchi, and this is definitely my favourite so far. Can't wait to try it out. Can you believe I have never made gnocchi? It's true. It always looks wonderful, so now I think I'll have to try it! Just made this last week and absolutely loved it. So fresh and delicious! Thank you!